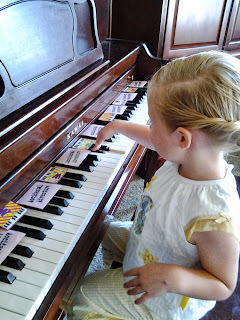 Imagination makes piano teaching come to life ... especially when you're having fun with a curious 3 year old. My little girl is lately really liking to be BIG like her siblings, which fortunately for me means she's big enough to "practice piano" just like them. I loved the reminder from Joy's NCKP notes about the natural teaching sequence of Sound, Feel , Sign , Name and although this wasn't a new concept for me, sometimes its not my first instinct to introduce sounds first..
she closed her eyes and listened to me play either a 2 or 3 black key group going up melodically and had to guess if I was playing a "garage" or a "doghouse"
2 - FEEL We reversed roles in the game as she played groups of black keys for me to guess. 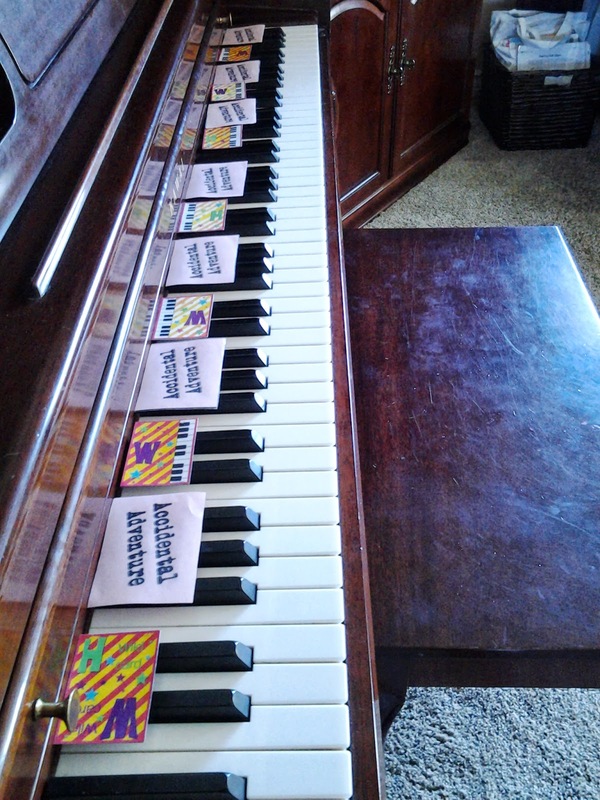 At first this was a little tricky for her so to help her see the groups of black keys better, I grabbed some game flashcards and had her first add "roofs" over the doghouses (groups of 2 black keys). She counted them, played "Hey Diddle Diddle the D's in the Middle" and then added rooftops over the garages, which were obviously bigger because it takes more room to fit 2 cars (G & A keys) in a GArage then 1 dog (D) in a doghouse. I like how adding the rooftops makes the black key group pattern so much more salient. And just in case the colorful cards piqued your curiosity, you can find the Whole/Half Step game at Susan Paradis.com and Accidental Adventure at Pianimation.com. 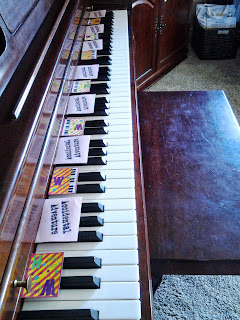 For a fun way to sharpen ear training skills with common music patterns see my post on Technique Pattern Bingo.